A sense of participation and opportunities to share and participate in activities or groups that are important to them are crucial factors in human wellbeing. 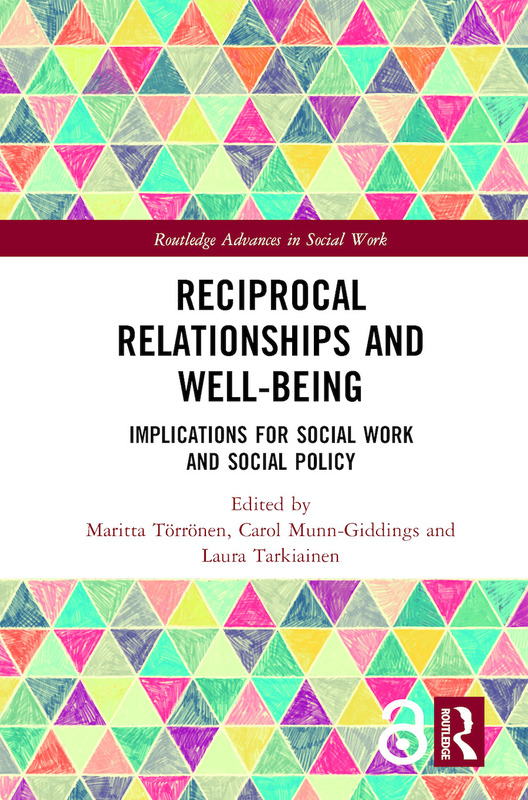 This book provides a robust empirical and theoretical analysis of reciprocity and its implications for social work and social policy practices by discussing how ideas of reciprocity can be understood and applied to welfare policy and social care practices, as well as how the act of reciprocity supports the wellbeing of citizens. Contributions from Finland, Germany, Russia, the UK, the USA and Canada illuminate the ways in which socio-political contexts influence the power relations between citizens, practitioners and the state, and the potential (or otherwise) for reciprocity to flourish. It will be essential reading for social care practitioners, researchers and educationalists as well as postgraduate students in social work and related social care and community-oriented professions and social policy makers. Maritta Törrönen is Professor of Social Work at University of Helsinki. Her main research interests concern theory of reciprocity, global welfare society, communities, power relationships, everyday life and well-being, which have points of reference with social work and social policy, childhood, child protection, family research and ethnic studies. Her recent research is linked to international social work and proactive social work. She is leading the project "Reciprocal Encounters – Young People Leaving Care" funded by EU during 2016-2018. Carol Munn-Giddings is Professor of Participative Inquiry and Collaborative Practice at Anglia Ruskin University, England. She joined ARU in 1995 after many years as a social researcher and research manager in various health and social services settings. Her research focusses on ways in which citizens and citizen groups with a direct experience of a health or social situation can inform the development of appropriate health and social care services. She leads and contribute to a number of regional, national and internationally funded projects in relation to these areas and is host/mentor for the EU funded project (2016-18) Reciprocal Encounters – Young People Leaving Care led by Prof Maritta Törrönen. Laura Tarkiainen is a doctoral student of Social Work at University of Helsinki. Her main research interests concerns discourses on prolonged unemployment, poverty and deservingness. Laura locates herself within the social constructionist and critical social work tradition, and has a special interest on discursive methods and questions that sit on the boundary surface of social and labour policies.